Strong hold matte moulding crme. Get onto the hard stuff with this strong hold multi-purpose styling tool that really goes the distance. Texturise, mould, piece or simply just shag it out any way you want for that totally 'lived-in' look. Gives texture, volume and definition. Creates matte, but lived-in finish. Tried everything else over many years 'cos it seemed like a good idea at the time' and I just keep coming back. Well worth the money, strong lasting hold right thru til bedtime!! 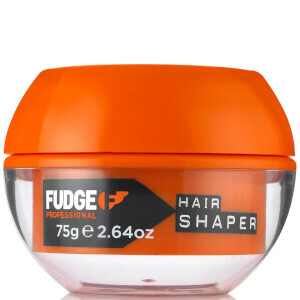 Have been using Fudge for 5 years and its never let me down even in rain - would never consider using anything else. It's quite powerful and is able to tame my thick hair. Moreover, it seems to last for quite some time; which is a plus. It does have a strong smell, but I found that to be more pleasant than annoying. However, those who mind having greasy hands every time they touch their hair, should avoid using this product - It will make hands sticky when you touch your hair, even if a small amount is used. This is a factor that might prevent me from buying the product again in the future. This was one of the first "new wave" hair products I tried back in 2001. It's sticky, sweet-smelling and a little 'teenage' these days; I prefer something subtler. The hold is decent on short hair but the finish can be greasy. Make sure you only use a little bit! Felt really let let down by this product. After reading about the reviews was hoping to find a different styler, but was bitterly disappointed. May be good for shorter hair, not sure, but for mid-longer not good at all, no hold and far too greasy.